We always talk about how personal putters are, and for most that hinges a lot on looks. But that creates a bigger question, if a putter performs, if it truly performs, can you get over the appearance? This is something I personally have battled off and on, a never ending back and forth of performance versus looks, so when one of the most unique looking putters I have ever had come across my review desk came in, that internal battle was reignited. 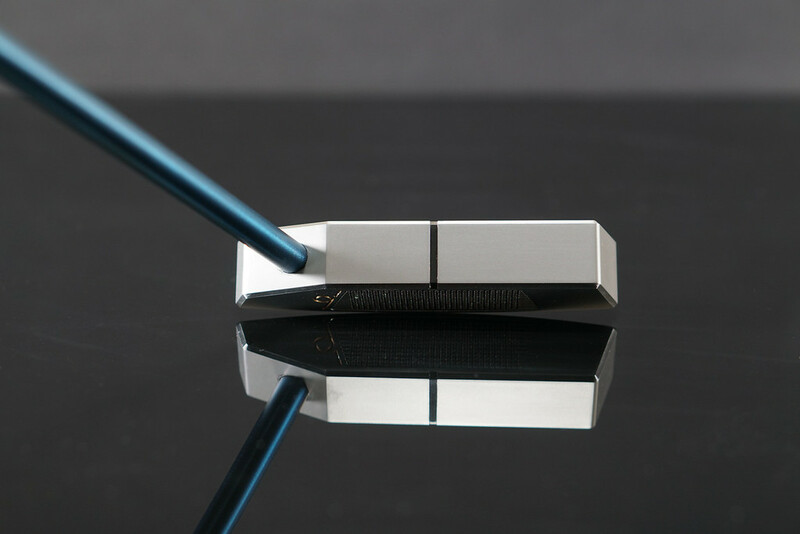 The Flux “Unity” putter is a lot of things, it’s science, it’s technology, it’s innovation…and it is also industrial, two sided, and truly unique. So, getting this one in for review created a hundred thoughts and emotions all rolled into one. There is a story to be told here, so shall we? Let’s get it out of the way, there is a LOT going on here where looks are concerned. First, it’s an ambidextrous putter! But not only is it two-sided, it’s not your grandpas old Bullseye. There is a more industrial look to the Unity which features harder edges as opposed to rounded curves. Also, its got more width to it than traditional two-sided putters, about half the diameter of a golf ball which gives it a way more “normal” look. When I put this one at address, it was no where near as daunting as the initial pictures lead on. More unique than the shape at address is that this is a straight shaft heel shafted putter with no offset and that at setup you can ever so slightly see the insert/face on both sides of the putter. The bigger part though is that Flux is not afraid to be different, and they are not going to cut corners. The putter is accompanied by a unique putter cover reminiscent of a holster with the strongest magnets I have ever seen in a putter cover (with a built in magnetic ball marker that is super clever) and a “case” which Flux calls the “Bandolier” that is aesthetically very much like a gun case, both of which are extremely high quality. While the similarities to a gun case may potentially turn some off, to me it is simply a clever move to deliver this putting “weapon” to its user in such a manner, and clever is fun. 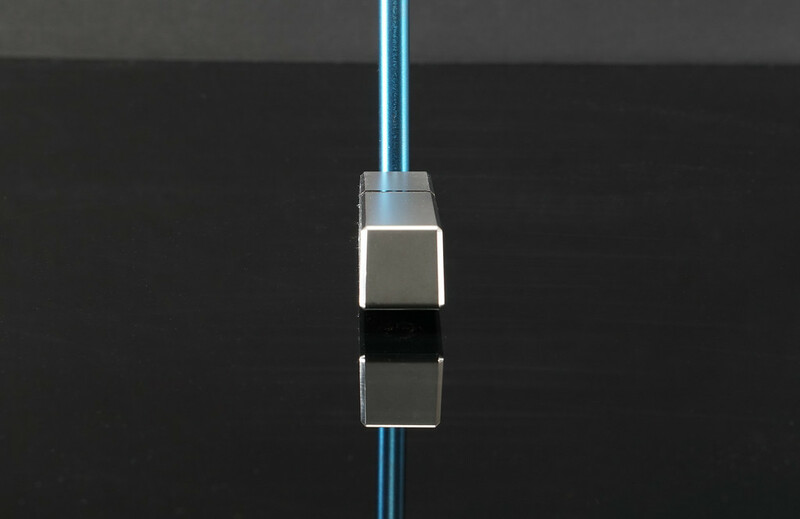 From a finish standpoint, we received the “Rain” option which is a slick satin finished putter-head paired with a deep matte blue shaft that absolutely stands out as much as any other aspect of the package. Never did I think blue would look good on a putter shaft, but out in the sun it pops and drew as many comments as the shape did. DARtech stands for “Directional Angular Rotation” and refers to the insert design that Flux founder John Anton has worked on for 10 years. The insert comes in either polymer or aluminum (we received aluminum) and while many grooved putters out there talk about a fast roll, the pattern here considers not only elimination of backspin/skidding but also the sidespin that sometimes occurs because they understand the putting stroke is an arc. Lots of words, but here are the most important ones, it works. Entering the review, I was completely hung-up on the wild look of the putter, but the first roll very seriously flipped that on its ear. Flux has made no bones about their belief in DARtech, and even go so far as to openly state “ALL CHALLENGERS WELCOME” because according to them, they are the only putter on Quintic or Trackman to create true overspin. What did this mean on the course? One of the most consistent putters I have ever used, and maybe the best roll of any putter this putter addict has ever experienced. Another shocker in-hand was the heft of the Unity, for such a small looking head it is heavy. When measured, the total weight came in at 631g, 50-80g heavier than the rest of my putters. Part of this is the 365g head, but the rest is the shaft weight, and more importantly the Gravity Counterweighted Grip. The grip is unique to flux (and I will have a review coming on just the grips very soon), and weighs in at a hefty 130g. What this did on the course was balance out the overall weight by placing more in the hands during the stroke and thusly getting that balance point up a bit in the design. In the stroke, it feels substantial, but not like a brick attached to a stick, and this really seemed to free up the stroke. The other aspect is the FloW8 MOI Equalizer. 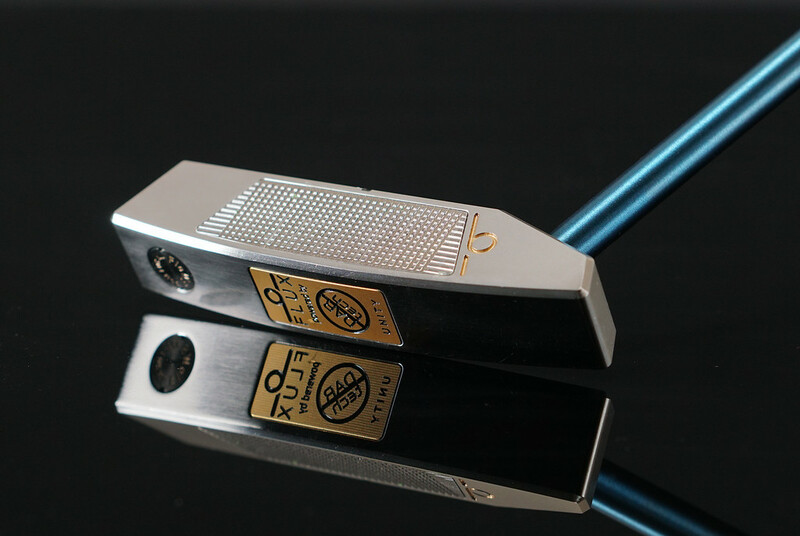 According to Flux, they have created a true blade putter with, wait for it, a high MOI. 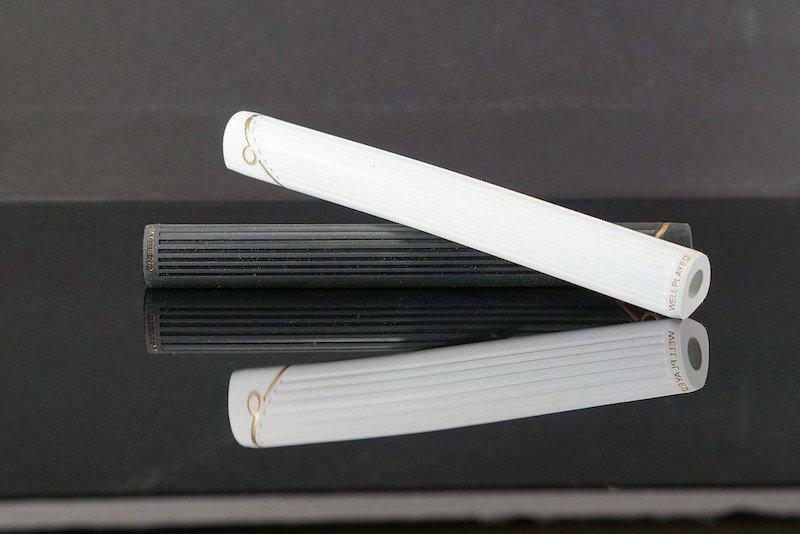 Right now many of you are thinking, “What?”, but the design is sound. Because the putter is full toe-hang, they decided to place a 30g tungsten weight in the toe and then add that insanely unique straight shaft in the heel of the putter. According to them this generated significant MOI via the dual stability of the shaft (heel and straight creating a pivot point of sorts) and the tungsten toe weight (helping the putter complete its arc through the stroke with ease). In practice, this too was noticed a lot, and not just by me but also by everyone who tried the Flux Unity. The putter honest to goodness just wants to arc freely back and through regardless of the degree of arc used in the stroke. Essentially, Flux melted my mind a bit with the Unity. Aesthetically, it is clearly going to be a big time hit and miss putter option as some won’t give it a second glance based on that alone. But tech wise, there is honest-to-goodness science here, and it works shockingly well. The roll and consistency of the Unity is addicting, not only that, it feels tremendous at the same time. The Unity is priced at $375.00. With any smaller company, getting them into the hands of the people to try and not simply pre-judge will be the battle, but I for one am hoping Flux finds a way to do it. 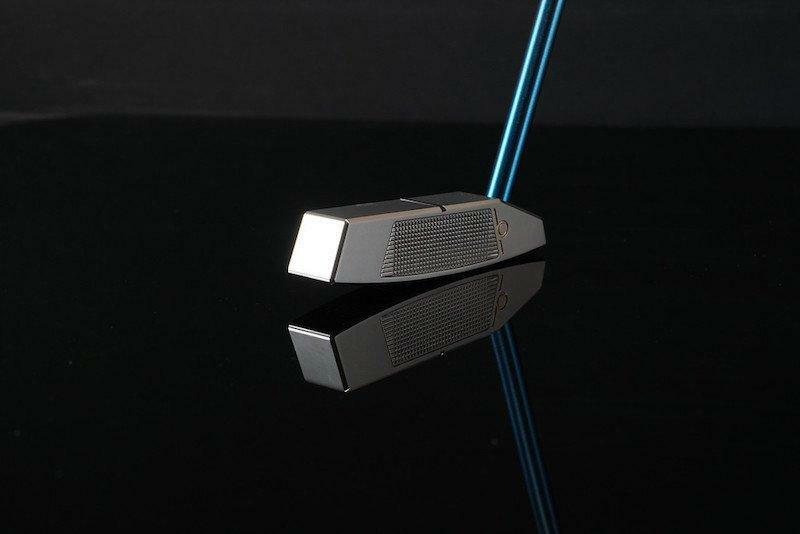 More on the Unity as well as their more traditional style blade the “Harmony” can be found at www.FluxGolf.com. With $600 price tag, not something I may “give a try”. As putters get stranger and more expensive, it gets me thinking I may just go the the hardware store and grind my own. Another well written and in depth review James. You almost had me wanting to try it until I saw the price. Great review James! I had no idea they were local for me. Great review James. Been looking forward to this one. I actually don’t mind the looks at all and would love to try it both RH and LH.